In this R Tutorial, we will complete data analysis and data visualization with get_map and ggplot of Northern California earthquakes between 2002 and 2018. The earthquake data will be analyzed based on total occurrences in each location and will graphically be displayed. However, for this tutorial, we will only analyze earthquakes with a minimum magnitude of 3.0. The earthquake data will be analyzed based on the magnitude class and the percentage of each scale based on the common occurrence of each scale from Minor to Great. Now that our libraries are installed, let’s pull in the data and take a look at the summary of the Northern California earthquake data. The above outputs from the summary() and head() functions help to display the earthquake data. The next step is to use the lapply() command and see classes of data we have. Below is a simple plot to plot the magnitude of each earthquake. As you will see, it’s a bit scattered and pretty much blacked out because of the large amount earthquakes over the last 16 years. Most of which are lower scaled earthquakes. Another plot that we could make that would be easier on the eyes is the qplot(). This will label the mag on the x-axis and the count(total) on the y-axis. Also, we will add the numbers of bins to break the magnitude down into 92 bins. We will adjust the bins from 92 to the number of levels we have which is six. Bins don’t technically correspond to the number you put in. You can add more control over the bins by adding more precise breaks. In our case, we won’t need to do so because as you will see below, the breaks are precise with our data of magnitude for earthquakes. In the next two steps, we will be creating two columns to group the earthquake class and scale for plotting. Now that we have the data imported, let’s create an additional variable to categorize the class based on the magnitude. Personally, I believe this will be the easiest and most efficient way to distinguish between the earthquake class and size. Now let’s create an additional variable to categorize the class based on the magnitude. Personally, I believe this will be the easiest and most efficient way to distinguish the earthquake size. > norcalearthquake$Scale[norcalearthquake$Magnitude >= 8] <- "Great Damage"
norcalearthquake$Magnitude <= 7.9] <- "Serious Damage"
norcalearthquake$Magnitude <= 6.9] <- "Much Damage"
norcalearthquake$Magnitude <= 6.0] <- "Slight Damage"
norcalearthquake$Magnitude <= 5.4] <- "Minor Damage"
> norcalearthquake$Scale[norcalearthquake$Magnitude <= 2.5] <- "Limited Damage"
Now that we created the new column scale, let’s check to make sure this data is correct. "Minor Damage" "Minor Damage" "Minor Damage" "Minor Damage" "Minor Damage" "Minor Damage"
The above shows that the first six lines of class are “Minor Damage”. With the addition of the new scale column, we will create levels on the column by using the levels() function. The levels() function provides access to the levels attribute of a variable. The first form returns the value of the levels of its argument and the second sets the attribute. Now we can confirm the five levels were created on the scale by running the levels() function. "Great Damage" "Serious Damage" "Severe Damage" "Slight Damage" "Minor Damage"
After confirmation of the levels, each class must be counted and any NA values must be omitted before we create a ggplot() for magnitude scale. As you can see from the above, we do not have any “Limited Damage” because the range is less than 3.0 and the earthquake data is 3.0 and greater. In addition, the above output is correct and totals are grouped by each scale level without any NA values. Now the data is cleaned up, we will be creating a ggplot() + geom_bar() to visualize the damage among earthquake magnitude scales. The above is exactly what we needed but we could make one change based on the magnitude scale. We will need to create levels based on the severity of the magnitude scale. Once that’s completed, we will just re-run our ggplot() command. > norcalearthquake$Class[norcalearthquake$Magnitude >= 8] <- "Great"
Now that we created the new column class, let’s check to make sure this data is correct. "Minor" "Minor" "Minor" "Minor" "Minor" "Minor"
After confirmation of the levels, each class must be counted and any NA values must be omitted before we create a ggplot() for magnitude class. The above output is correct and totals are grouped by each class level without any NA values. We will complete the same steps as scale but we will use the class data and a ggplot() + geom_bar() to visualize the damage among earthquake magnitude classes. The above is exactly what we needed but we could make one change based on the magnitude class. We will complete the same steps as the magnitude scale severity but create a new set level by magnitude class and then re-run the ggplot() + geom_bar() plot. Now as you can see, the x-axis is now categorized by the factoring of the magnitude class levels from least to greatest. 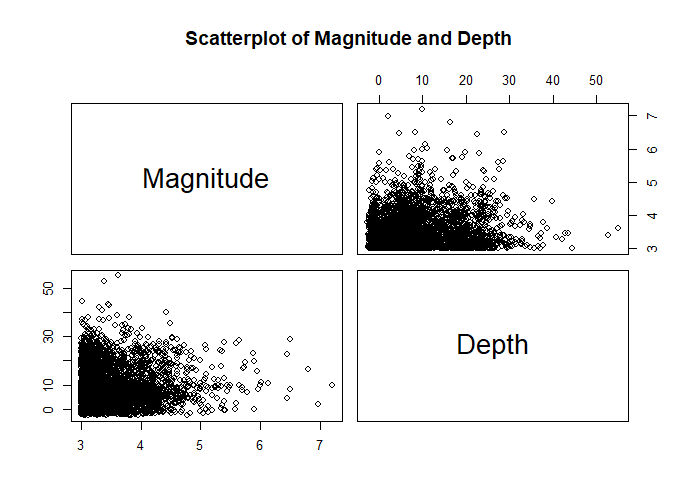 With the above details, a scatterplot matrix can be created to confirm if depth has any significant value for an earthquake’s magnitude is scaled between 0 and 8. From the above plot, we can see a correlation between depth and the magnitude in the event of an earthquake. Magnitude is determined by measurements on seismographs. In addition, magnitude measures the energy released at the source of the earthquake. Now that our data is clean and ready to map, we will be using the get_map() and ggmap() functions. The get_map() function is a smart wrapper that queries the Google Maps, OpenStreetMap, Stamen Maps or Naver Map servers for a map. We can change the color of the map to either color or black and white, but in this tutorial, we will be using the color map. Let’s take a look at creating the map with the ggmap() package and we will be adding gradient colors to the map for earthquake locations using Latitude and Longitude. The ggmap() function is a collection of functions to visualize spatial data and models on top of static maps from various online sources (Google Maps). A few cool tools within the function includes tools common to those tasks, including functions for geolocation and routing. As you can see from the above, we can see that California has a vast amount of earthquakes in the same regions. In addition, we can confirm that earthquakes with a higher magnitude size, most will have a deeper depth.